Oh, for goodness sake. 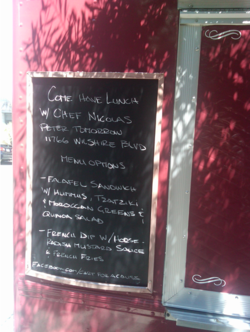 If I hear about another food truck, I might actually finally lose my marbles (and my lunch). If you feel the same, I feel your pain. 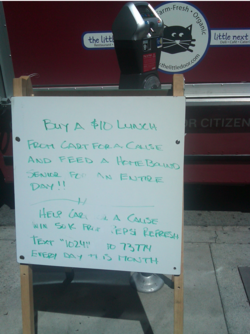 AND YET, when I walked past Little Next Door a few weeks ago and discovered Cart For A Cause, I was impressed and just had to share. You may already know about this venture, so forgive me if you do, but basically St. Vincent's Hospital has teamed up with various celebrity chefs around LA, who donate their talents to create and serve gourmet lunches every Tuesday for $10 a pop from this very truck above. The funds raised go to supporting the hospital's Meals on Wheels program. So, for instance, you get Nobu for $10 AND you get to feel like a do-gooder. Sounds like a no brainer to me. P.S. 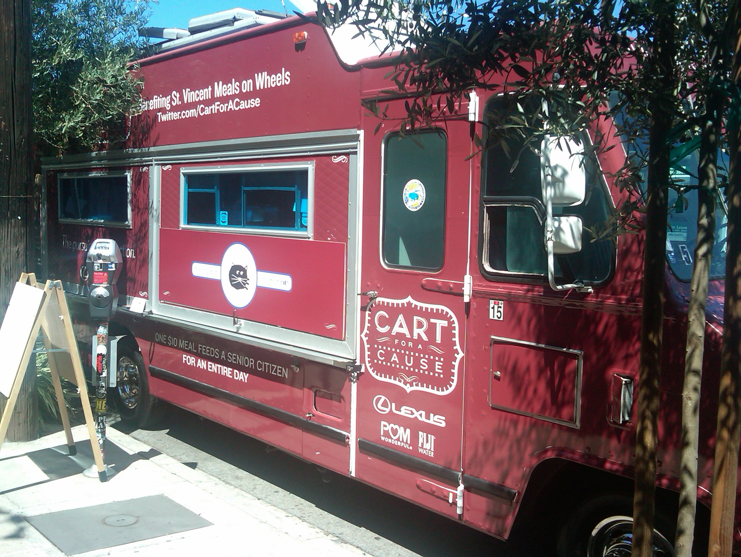 The chefs involved and the truck's location depend on the week, so you can just follow them on Twitter (@Careforacause) to find out the deets. P.P.S. The below pictures were snapped weeks ago and the info/menus are obsolete, but they still offer a sense of what you might find!